Speaking to Omnisport, Denmark captain Kjaer – whose team will travel to Barcelona this week – said: "I am surprised, that we are top of the table right now - especially after losing two games in a row at the beginning of the season, but I am not surprised that we have developed to play so well. "It is too early to talk about that [winning the title], but no doubt that we enjoy the view from the top of the table right now. "Maybe it sounds a bit boring, but as a footballer you have to take one game at the time. Our ambitions are to have everything to play for when we approach the final weeks of the season, both in the Europa League, the Copa del Rey - and being up there with the absolute giants in LaLiga." "We have developed a lot in a very short amount of time, and there is a lot more to come, because we still have room for improvement," Kjaer said. "If we continue to keep this mentality with everybody willing to be working hard to win, we will be even more consistent and will have a great season, because we have a super, super squad for this kind of football. "The recent 3-0 win against Real Madrid was good for us as a team, and it was very well deserved, because we were definitely the better team. "Personally this amazing start of the season has felt like hitting the ground running after the incredible experience and pride of being the Denmark captain at the World Cup." 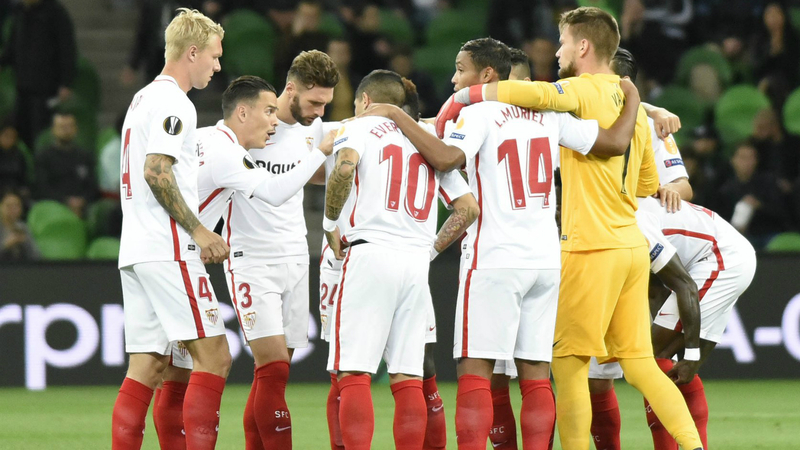 Sevilla's table-topping start to the season under head coach Pablo Machin comes after a turbulent 2017-18 campaign, which saw Eduardo Berizzo replaced by Vincenzo Montella in December last year. Montella masterminded Sevilla's shock elimination of Manchester United en route to the Champions League quarter-finals before he was sacked in April – Joaquin Caparros appointed on a caretaker basis prior to Machin's arrival in May. "It was definitely a strange and turbulent season with three different managers and two sporting directors in charge - with a lack of consistency and too many disappointing results in the league," Kjaer said. "But also with some amazing highlights." Kjaer added: "[This season] he [Machin] has a completely clear vision for how he wants us to play. He has certainly changed a lot. We now play with three at the back, and while he has been implementing that very quickly, he has still been willing and able to adjust things within his system, always seeking to optimise our game plan. "We started the season with one player up front, but the coach changed it to a two-man attack, and since then we have been scoring goals for fun. His ideas have been exciting, and I love the way we now play attacking football."